What is the purpose of installing a gate? Would you prefer to have it automated? Will it allow access to a particular area of your property? Apart from these essential questions, you also need to take an accurate measurement of the gate’s dimensions as well as decide whether you prefer a specific material over another. Lastly, think about the style and design of the gate you want to install. Here are some of the popular gate styles you can choose from. Swing gates come in a variety of designs and can be fabricated from different materials. SmartSteels.co.uk and most other suppliers have swing gates made with wrought iron or cast-iron steel. One advantage to a swing gate is that it does not require much maintenance. If you want more convenient access to your driveway, an automated gate is an excellent choice. Compared with manual gates, you can open an electric gate using a remote control. This type of gate is also more secure than a gate you need to open manually. If the property driveway is rough or space is limited, a sliding gate is a perfect option. But this type of gate comes with a track mechanism for the gate to slide on, so you also need to take the installation into account. Metal gates always look sleek and sophisticated. Another advantage of metal gates is the strength and durability. Steel gates won’t easily bend or break even when subject to high amounts of pressure. Iron gates can be custom-designed according to your desired specification and suit just about every aesthetic. Wood is a traditional option if you are looking for a gate to install on your property. It will complement a wooden fence well and has a lovely rustic appearance. But compared with metal gates, wood requires a bit more maintenance and tends to be susceptible to wear and tear. 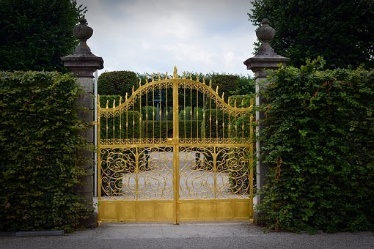 Securing your property and keeping trespassers at bay is typically the main reason for installing a gate. Depending on where you live, you may require a moderate or high level of security. As such, you need to base your decision on these factors to choose the right material and design for a gate. Stronger materials like steel are an optimal solution for increasing security. You won’t have to worry about anyone easily breaking through your metal gate. On the other hand, if high security is not a primary concern, you can choose different materials like wood or aluminium. You can also take into account the overall look of your property to find a perfect gate that blends with the surroundings.